Chantell Bergquist has always wanted to go to law school and came to Bemidji State for the 3+3 Law School Early Admission program through BSU and the Mitchell Hamline School of Law (MSHL). Get a jump start on law school. Fast track your undergraduate and law degrees with our 3+3 program offered in partnership with the Mitchell Hamline School of Law. 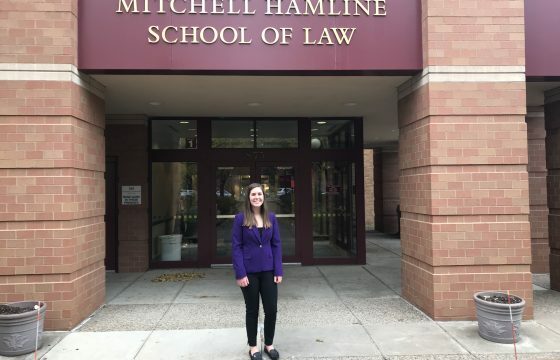 Students complete three years of their major at Bemidji State University before starting studies at the Mitchell Hamline School of Law, where the first year transfers to BSU to compete a bachelor’s degree. That’s a four-year bachelor’s and a three-year law degree compressed into six years. If you decide partway through your undergraduate work that the 3+3 program is not for you — or you are not admitted into the Mitchell Hamline School of Law — you may continue on with your major studies and graduate with your bachelor’s in four years. Students interested in the 3+3 program must meet with Dr. Patrick Donnay, pre-law advisor, as early as possible in their academic planning process and fulfill the program requirements.